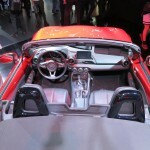 There were TONS of redesigns at the LA AutoShow, believe us. 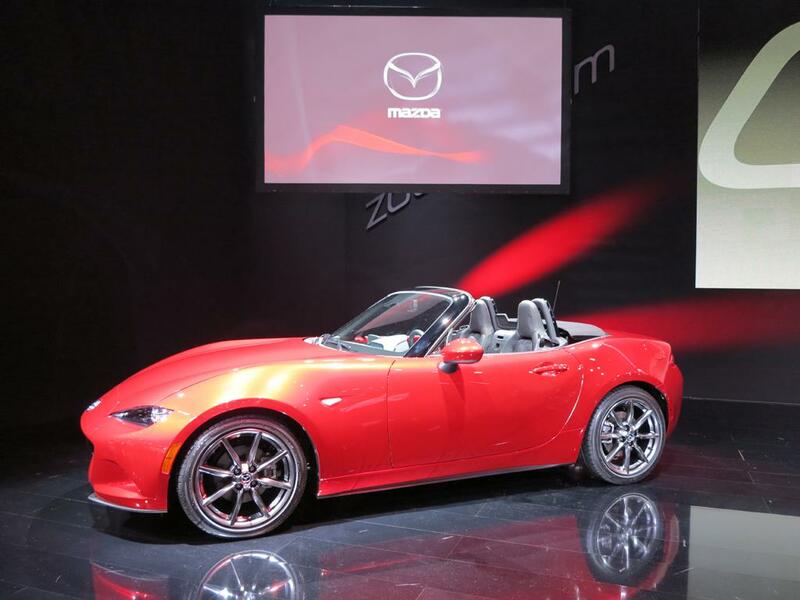 Mazda ALSO displayed the completely-redesigned 2016 MX-5 Miata and we got the first look. Previously you only say leather wrapping and stitched dashes on luxury cars but NOWadays leather wrapped and stitched dashes seems to be a new norm for the automobile industry. 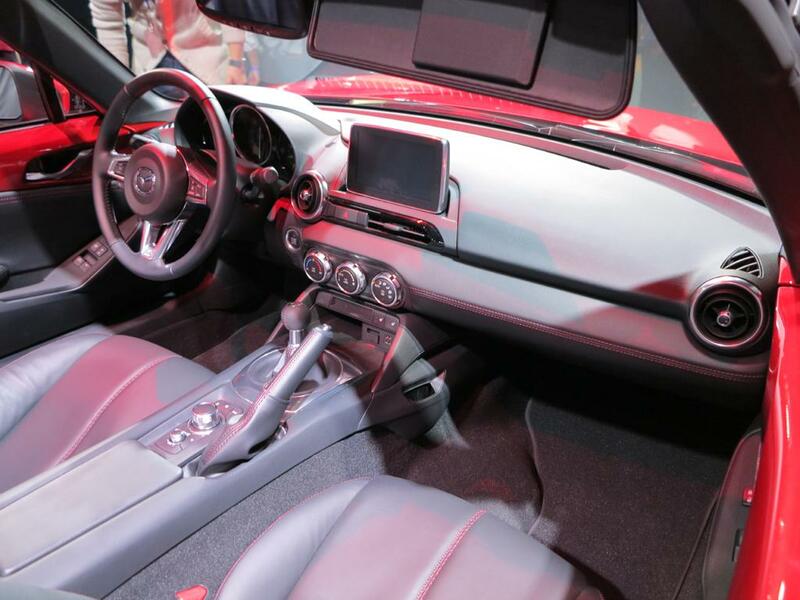 You can see the new MX-5 Miata is now flaunting leather all over. I had a chance to discuss Mazda’s future product plan with Mr. Masahiro Moro, Managing Executive Officer, Global Sales Coordination of Mazda. 3. 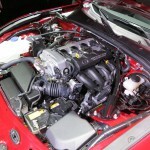 However, Mazda is still doing research on the rotary engine technology, and plan to build a new generation of such an engine. When asked why Mazda are still working on the rotary engine technology given the fact that, they are not going to build a new RX-8, Mr. Moro said the rotary engine is not only used in automobiles, there are many other applications (like for ships, generators etc. 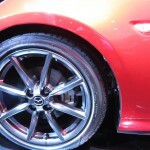 ), and Mazda is planning to compete in those applications and markets. 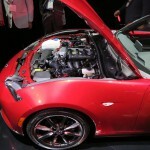 So I am glad that although there is not going to be an RX-8 model anymore, Mazda is not giving up the rotary engine. Below is press release for the MX-5 Miata. Nov 19, 2014LOS ANGELES, Nov. 19, 2014 /PRNewswire/ — In a press conference today on the floor of the 2014 Los Angeles Auto Show, Mazda Motor Corporation revealed the all-new 2016 Mazda CX-3 compact crossover SUV to the world. Sharing the spotlight with the CX-3 on stage was the 2016 Mazda MX-5 Miata, the fourth generation of the world’s best-selling roadster, as well as updated and revised models of the Mazda6 midsize sedan and CX-5 crossover SUV.Mazda North American Operations is headquartered in Irvine, Calif., and oversees the sales, marketing, parts and customer service support of Mazda vehicles in the United States and Mexico through nearly 700 dealers. Operations in Mexico are managed by Mazda Motor de Mexico in Mexico City. For more information on Mazda vehicles, including photography and B-roll, please visit the online Mazda media center at www.mazdausamedia.com. 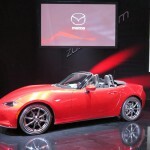 “Mazda is in a commanding position in the U.S. right now, outpacing a rapidly recovering auto industry,” said Jim O’Sullivan, president and CEO of Irvine, Calif.-based Mazda North American Operations. “Whether it’s the Mazda3, Mazda6 or CX-5, sales results and industry accolades allow me to say that if you think there’s a better vehicle in these segments than these cars, then you’re wrong. And whether we look to breaking ground in new segments with the all-new CX-3 or reinforcing our sports car credentials with the all-new MX-5 Miata, there’s no denying that these are very good times indeed for Mazda.”The 2016 Mazda CX-3 complements the Mazda lineup, as it perfectly hits the target in a rapidly growing segment in the industry. The all-new compact crossover SUV offers all the essentials young urbanites are looking for in a car: a design of overwhelming quality and style, packaging developed solely with their needs in mind, and the responsive driving feel that is a hallmark of every Mazda. Powered by a SKYACTIV-G 2.0-liter gasoline engine in North America, CX-3 will be equipped with an automatic transmission with either front- or all-wheel-drive. Output details and specifications will be revealed closer to launch, in summer 2015. 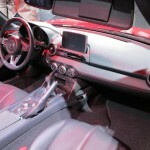 The 2016 MX-5 Miata is the latest iteration of the world’s best-selling two-seat roadster, with more than 930,000 sold globally and nearly 40 percent of those in the U.S. After making its global debut in three cities around the globe simultaneously in early September, it is making its North American auto show debut in Los Angeles. 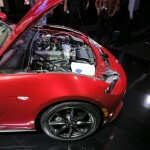 Powered by specially turned SKYACTIV-G 2.0-liter engine, MX-5 is every bit the real sportscar. With a curb weight approximately 200 pounds lighter than the outgoing model, the new MX-5 will perform like enthusiasts and weekend-racers alike would expect, a true embodiment of the “lightweight sports” Jinba Ittai (literally “horse and rider as one”) ethos. Also making their global debuts during the announcements made during the show were revised versions of the 2016 Mazda6 midsize sedan and the 2016 CX-5 crossover SUV. Both vehicles feature updated interior and exterior styling, the sort of updates you would expect in vehicles either growing long in the tooth or not selling well. Neither of those accurately describe these two vehicles however, as both are exceeding previous years’ sales numbers by more than 25 percent, as well as winning awards and accolades on a regular basis. Both Mazda6 and CX-5 see extensive updates to the interior, highlighted by the addition of Mazda’s proprietary in-car infotainment system, Mazda Connect. The system has been well received since launching in the 2015 Mazda3, and will be standard equipment across trim levels. 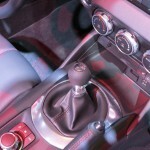 Mechanically, both models see the addition of an electric parking brake and newly designed alloy wheels. Additionally, both vehicles receive revised front and rear lights, as well as the addition of LED lighting on certain trim levels. Exclusive to Mazda6 is the addition of a unique addition to the car’s nighttime lighting signature, as the distinctive five-point grille is edge-lit on certain trim levels. 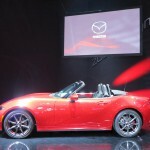 All these new Mazda vehicles – with the addition of Mazda3, Mazda5 and CX-9 – will be on display throughout the run of the 2014 Los Angeles Auto Show. Additionally, Mazda will show the just-debuted Global MX-5 Cup racing version of the MX-5, as well as other special racing and one-off project vehicles. Check out the 2014 Los Angeles Auto Show Press Kit for information on the all-new 2016 CX-3, new information on the 2016 MX-5, and information on the refreshed 2016 Mazda6 and 2016 CX-5.